Inspired by Garden & Gun magazine’s popular “Good Dog” column, a rich collection of true stories celebrating the unique relationship between humans and their canine companions, penned by some of today’s top writers, including Jon Meacham, Roy Blount, Jr, Dominique Browning, and P.J. O’Rourke. When Garden & Gun magazine debuted a column aptly named “Good Dog,” it quickly became one of the publication’s most popular features in print. Now, Editor-in-Chief David DiBennedetto (proud owner of a Boykin spaniel) and the editors of G&G have gathered the most memorable stories, as well as original pieces, in this collection of essays written by some of most notable dog owners in literature and journalism. 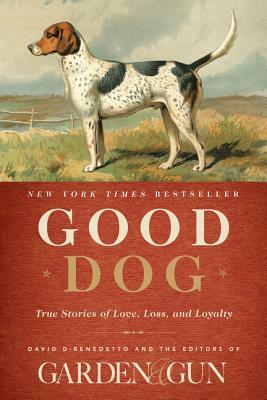 Good Dog offers memorable, beautifully written stories of dog ownership, companionship, friendship, and kinship. From the troublemakers who can’t be fenced in to the lifelong companions who won’t leave our sides, this poignant anthology showcases man’s best friend through all of his most endearing—and sometimes maddening—attributes. By turns inspirational and humorous (just like the dogs we love), Good Dog is a must-have collection for dog lovers everywhere. Garden & Gun is a national magazine that covers the best of the South, including its sporting culture, food, music, art, and literature, and its people and their ideas. The magazine has won numerous awards for journalism, design, and overall excellence, and its two previous books, The Southerner's Handbook and Good Dog, were New York Times bestsellers. David DiBenedetto is the editor in chief of Garden & Gun magazine. He is the author of On the Run: An Angler’s Journey Down the Striper Coast and the editor of the New York Times bestselling The Southerner’s Handbook. He grew up in Savannah, Georgia, and now resides in Charleston, South Carolina, with his wife, Jenny; their son, Sam; their daughter, Rose; and their Boykin spaniel, Pritchard. — Mika Brzezinski, MSNBC's "Morning Joe"